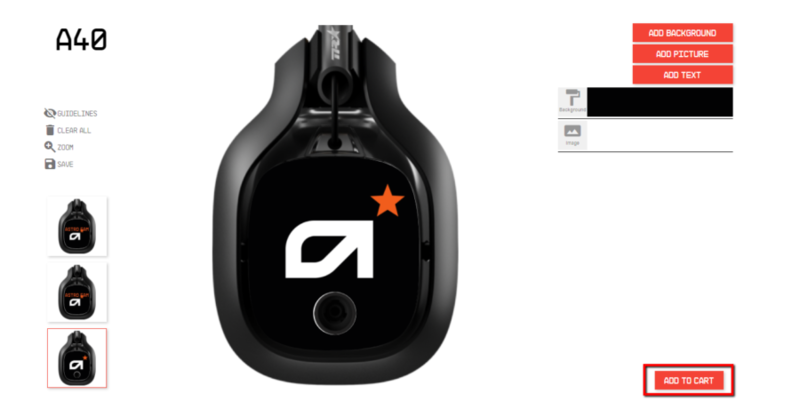 At ASTRO Gaming, we believe in customization of your game audio experience, from the inside out. Removable, customizable A40 TR Speaker Tags gives gamers a unique way to express themselves the same way a MixAmp Pro TR delivers customized gaming audio. 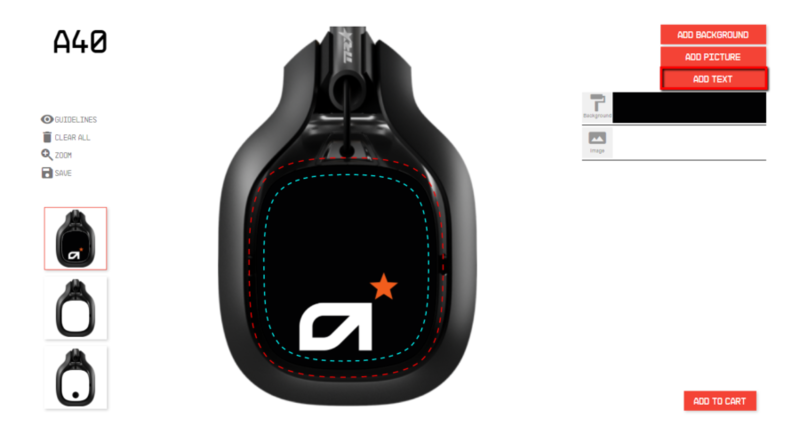 We’ve updated our ASTRO Tag Customizer, and it’s more powerful than ever before. 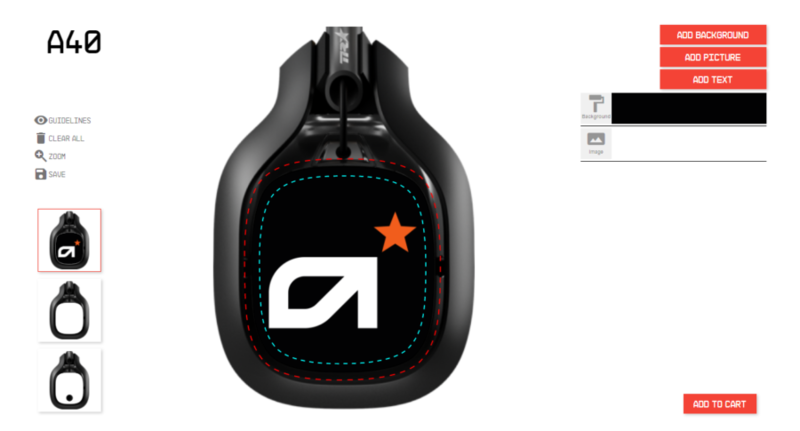 The ASTRO customization engine enables you to customize and print your own designs directly on A40 TR Speaker Tags. Below is a quick guide to help you get custom Tags right for you. To add a base Tag color, click the “Add Background” button. Select the desired color from the pop-out window; change or remove it at any time during this process. To get you started, we have default guidelines you can use to make sure everything designed won’t get cut off. Toggle these lines on or off by clicking the “Guidelines” button. *Copyright Compliance: Before you can submit your order you must confirm and guarantee that you have all necessary licenses, rights, consents and permissions to all the uploaded material in your tag design. For best results, have a file size of at least 300 dpi (820 x 940). – Click the “Add Picture” button. – To upload your images, click the “Click Here” button. – Use the “Browse” button to locate the image you wish to use. File types are limited to .JPG, .PNG, and .BMP and restricted to 5MB or less. Click “Upload” to load it onto the selected Speaker Tag. – To resize your image while maintaining the aspect ratio, use the 2 arrow button on the bottom right of the image. To resize without maintaining the aspect ratio, use the 4 arrow button on the bottom left of the image. We have uploaded a library of icons designed by us, and are available for use on your Speaker Tags. All the icons are scalable. Drag the corners to size, and the others to stretch. Drag the image itself to place. Delete the image at any time by clicking the garbage can icon. -Click the “Add Picture” button to see the entire library. – Browse the collections and use the scrollbar to see the different icons available. You can bold, italicize, or underline your text. You can also adjust the color by clicking on the “Color” drop-down menu and selecting a color from the popup. You can also select which font you want to use from the “Font” drop-down menu. Once you’ve added text to your Tag, you can drag and drop the box, or delete it entirely and start over. – Click the “Add Text” button. – Enter your custom text in in the text box. – When you’re done, click “Save”. – Select which Tag you want to copy from, and it will be applied to the selected Tags. 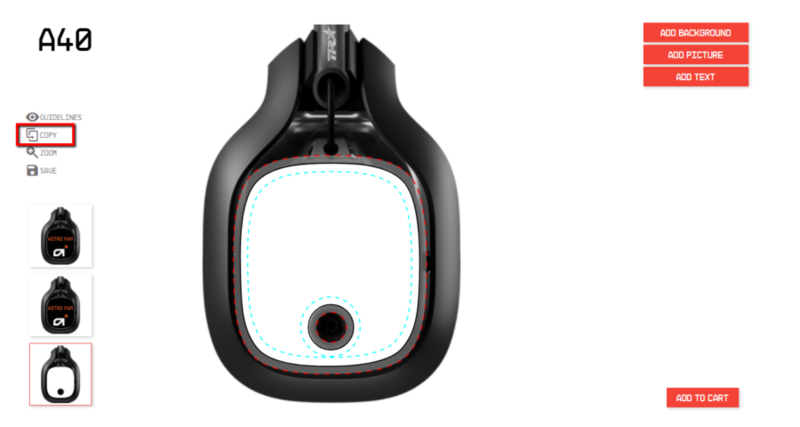 When designing your Speaker Tags, don’t forget our third Tag has a hole in it for the swappable mic. Adjust your design with this in mind. If you always run your mic on a certain side, the mic body will block the front bottom corner of that Tag. 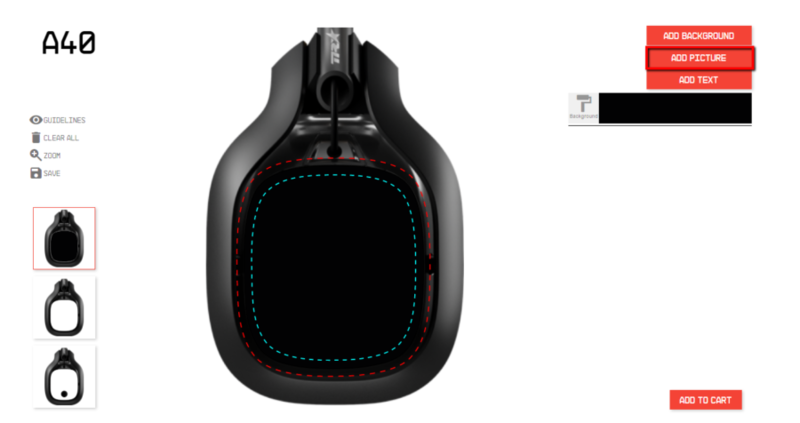 You can save your finished Speaker Tags for later with the “Save” button. Copy the link in the pop-up window and paste it into a browser at any time. 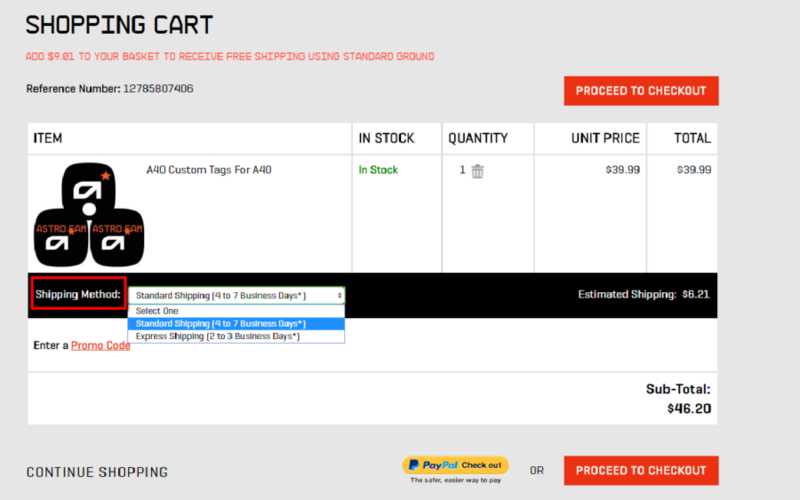 – Once you’ve finished all three Tags, hit the “Add to Cart” button. Select your shipping method*, and complete your purchase. An email confirmation will be sent shortly after your order is placed. Sit back, and wait for your awesome new Tags to arrive to your door! *Custom tag orders ship from a separate warehouse from the rest of our products and thus will likely arrive at a different time from the rest of your order (unless your order is custom tags only). Printing times can take anywhere from 1-2 business days depending on the complexity of the uploaded design(s), so orders could take as long as 3 business days to ship. Once the order is in transit, transit time will vary depending on the shipping method of choice: 5-7 days for Domestic (US) ground shipping. As always, we’re here to help. So if you need help, you can reach out to Customer Support!